Midfielder Barry McNamee is delighted to get the Derry City captain's armband. 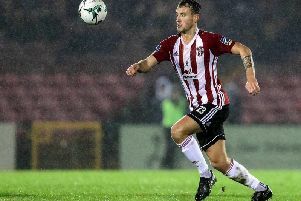 DERRY CITY’S new skipper Barry McNamee knows he has big boots to fill. The talented midfielder, who re-joined the Candy Stripes only a few months ago after a somewhat unhappy time at Cork City last season, feels he will bring different aspects to the captain’s role. “Once Declan asked me, I was over the moon,” he explained. “Obviously Kevin Deery was captain when I first came on the scene and he’s on the management staff again and then I had the likes of Barry Molloy, Ryan McBride and Gerard Doherty as captain and they are all big names in the history of Derry City, so it’s big footsteps to step into. The Ramelton man concedes that his personality means he won’t be like a Deery or Molloy shouting at players, but he feels he’ll bring something different to the captaincy. “You’ll not see me screaming and shouting too much, obviously if it has to be done I’ll have to do it, but it’s more so trying to encourage the boys,” he added. “To be fair to me bravery is about getting on the ball and stuff like that, so I’m always going to be encouraging that and I don’t want any players shying away if you make a mistake, we have to be big enough and old enough now, especially after a mistake and just push on. As for boss Declan Devine he admitted it was a ‘no brainer’ to choose the talented 26-year-old as his new skipper and getting him back to the Brandywell was one of his biggest moments since returning to the club. “First and foremost, he’s a top player and a top person and getting Barry back to the club is one of the proudest things I have done since coming back to the club, because I know he's so sought after and when you sign a boy like Barry McNamee, you mean business,” he insisted. “He has up to now had a very good career and with a squad so young, you are looking around the changing room - Peter Cherrie could very easily have been the captain; Eoin Toal at 19 years of age could have been the captain; Greg Sloggett has been magnificent since he’s come to the club in terms of his appetite, his mental well-being in terms of driving himself on.